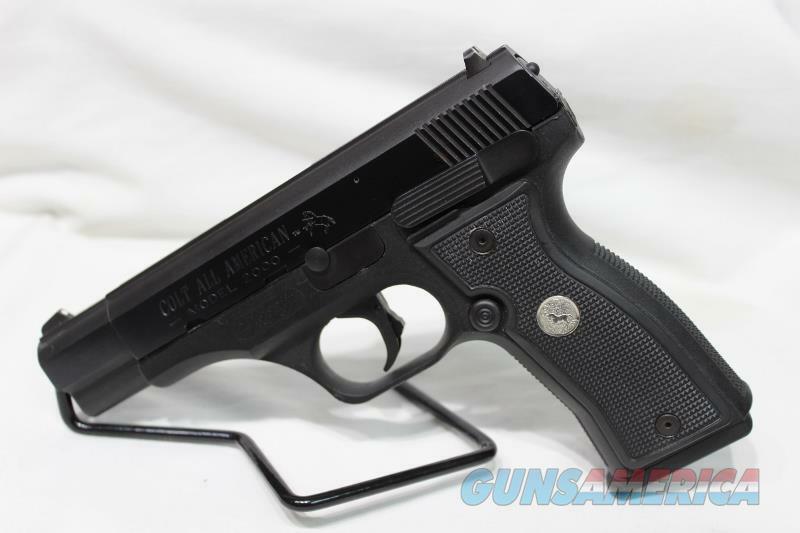 Description: Colt All American 2000, 9mm semi auto pistol, dbl action,15rd, 3 dot white sight, fixed, colt factory mag, hard plastic colt grips, polymer frame, steel slide, roller bearing mounted trigger, recoil operated rotary action, hammerless, 4.5" bbl, internal striker block safety, weighs 29oz, made 1991-93, checkered back strap, good condition, no dings, there is a small scratch near the ejection port, serial# PF03XXX, used, We are a FFL, Florida residents add sales tax for your county, there is no local pick up. The price listed is a cash price, credit cards add 3% to the total if over $100. We do not give out the reserve so please don’t ask, your email will be deleted with no answer. Money must be here within 5 days. Transaction must be completed within 10 days or the gun will be reposted. By committing to buy this item or gun you are saying that you are aware of all of the laws and restrictions in your state and you can lawfully own this item or gun. If you are in CA please add $15 for paperwork.